Helllooo TGIF!!! I hope you have some fun things planned for this weekend even if the weather is not the best. I am spending it with my favourite people in the world, hubby and my sister’s family. I cannot wait !!! Today I have a card that I wanted to make ever since my friend Sally made this card at my house (scroll down a bit). So I finally managed to get into it and have it made. 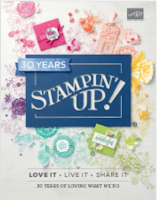 I chose to work with the Just Believe stamp set form the main Stampin’Up! catalogue, this is a great set with lots of images perfect for so many occasions. And yes you will notice that I have used the itty bitty punch again *sigh*. I have also used the music wheel to add some background to my card blank and scrunched up some crumb cake seam binding , I love how this ribbon can look fairly elegant one second or shabby in the next. The Vanilla panel was sponged with crumb cake and soft suede ink and I lightly over stamped the edges of the panel using the stamp off stamp on technique. You ink the stamp well then stamp on a piece of scrap paper first then onto your card. ACCESSORIES: pearls and crumb cake seam binding. A5 card base in elegant eggplant, sponged in eggplant ink and overstamped with the music notes wheel in the same colour. Add 50 cm of seam binding tie into a long bow spritz with water and scrunch in your hands. Very Vanilla panel cut at 6.5cm x 12.5cm inked in crumb cake and soft suede and overstamped like explained above. Stamp main image in soft suede in the centre of your sponged panel and add the itty bitty flowers in eggplant. Top the centres with tiny pearls. 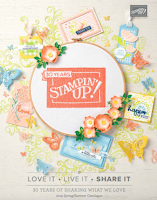 Stamp the frame and add your sentiment then cut out and place onto a decorative label shape punch in soft suede . Add the main panel to the card then add your sentiment. Gorgeous card Monica. Absolutely love the colour combo and will definitely be using it myself. Just beautiful Monica, I have to say I am loving the fact you are full time at SU now, lushness in abunace is happening nearly everyday, Love it! What an insight review, I love your post. Stunning card!! I don't have any elegent eggplant and guess that will be added to my wish list now :) This card is so lovely - I really like the way you put the cutout under the sentiment but ontop of the designer label punch. I also never thought to sponge and THEN stamp the borders...lots and lots of inspiration in this card!!! Great job! PS We visited London this summer and loved it ...wanna come back and see more of England! This is an absolutely gorgeous card, Monica! Such beauty!!! *SIGH* Love it to bits!